While the unemployment rate remained stable for the month of March, and job growth was lower than expected, the U.S. continued to add jobs across a variety of sectors. According to the Employment Situation released by the Bureau of Labor Statistics, the country’s unemployment rate did not change during March, remaining at a steady 5.5 percent. 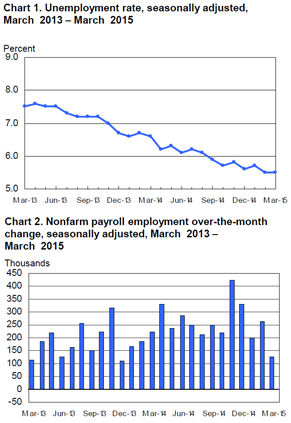 The overall number of people in the workforce was 8.6 million, up 126,000 from February. Between March 2014 and March 2015 the number of employed people has increased by 1.8 million, contributing to a 1.1 percent drop in the unemployment rate. The report explained that the civilian labor force experienced little change this month, staying solid at 62.7 percent. Notably, this number has mostly stayed between 62.7 and 62.9 percent since April 2014. The 126,000 new positions were spread among a variety of fields. The industry that added the most workers this month was the professional and business services sector, which grew by 40,000. Within this general field some of the areas where hiring went up included engineering services, management and technical consulting services, and computer systems design and related services. 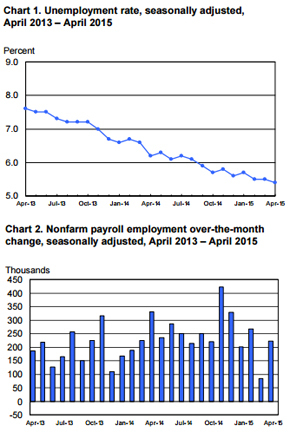 Healthcare also saw a larger workforce in March, growing by 22,000 employees. Most of these jobs pertained to ambulatory care and hospitals. Within this sector, nursing care facilities shrank by 9,000 positions. The retail industry continued its growth, adding 26,000 jobs. One of the fields that lost positions this month was mining, which shrank by 11,000 workers. 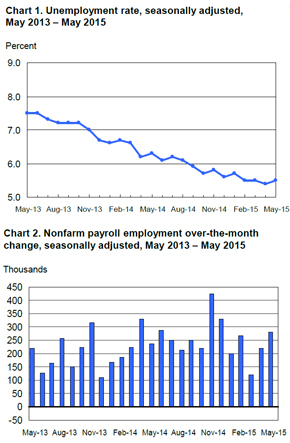 This industry added 41,000 jobs last year, but so far has lost 30,000 jobs in 2015. Many other industries, including food service, manufacturing, construction, government, financial activities, transportation and warehousing, and wholesale trade changed very little throughout March. The report indicated that hourly earnings increased for workers this month, going up by 7 cents to equal $24.86. This number has increased by 2.1 percent over the past 12 months. The average hourly earnings of private-sector production and nonsupervisory employees increased by 4 cents to rest at $20.86. While the report is stable, economists had predicted much larger growth, explained Nasdaq. Industry experts had anticipated that the nation would add 248,000 new jobs this month, while the actual number was significantly less. The source noted the Federal Reserve acknowledges that March’s report fell flat in the face of economists’ predictions, but it is not worried that the country’s economy is declining. If numbers get back on track to improving at higher rates, the organization plans to increase interest rates.